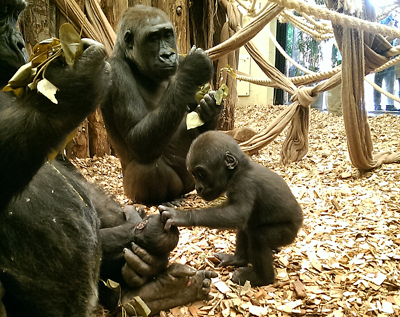 Female infant gorilla Alika, who celebrated her first birthday at ZSL London Zoo in Regent’s Park last week, is pictured getting to know her two week old baby brother, Gernot. 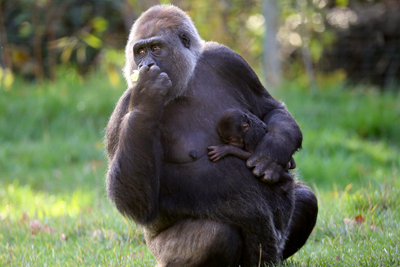 Named after the partner of a generous donor who has supported the Zoological Society of London’s (ZSL) international work for wildlife, Gernot (below, top) was born to 22-year-old female Effie and 17-year-old silverback Kumbuka on 25th November, both Western lowland gorillas, and can most often be found tightly snuggled in Effie’s arms (below, bottom). 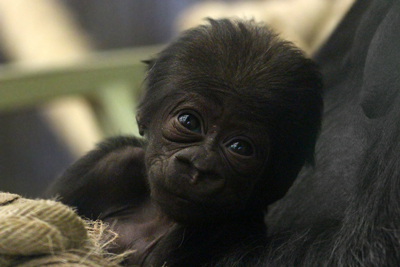 Gorilla keeper Glynn Hennessy said while Gernot had become the “centre of attention” at the zoo’s Gorilla Kingdom, “one-year-old Alika has embraced her new role of the doting big sister”. “Western lowland gorillas live in troops and learn how to act from observing each other’s behaviours and manners and here we can see Alika demonstrating some of the nurturing skills she’s learned from the adults.” This has included touching his head and stroking his face as he sleeps in his mother’s arms. For more, see www.zsl.org. PICTURES: ZSL London Zoo.